On Sunday 1st February members of Fort Portal birders and NatureUganda gathered at Saka Lake to celebrate World Wetlands Day. This annual event takes place to highlight the many pressures that our diminishing wetlands are facing worldwide. Here in Uganda we are blessed with many wetlands but we should not be complacent and be ever vigilant to their destruction. 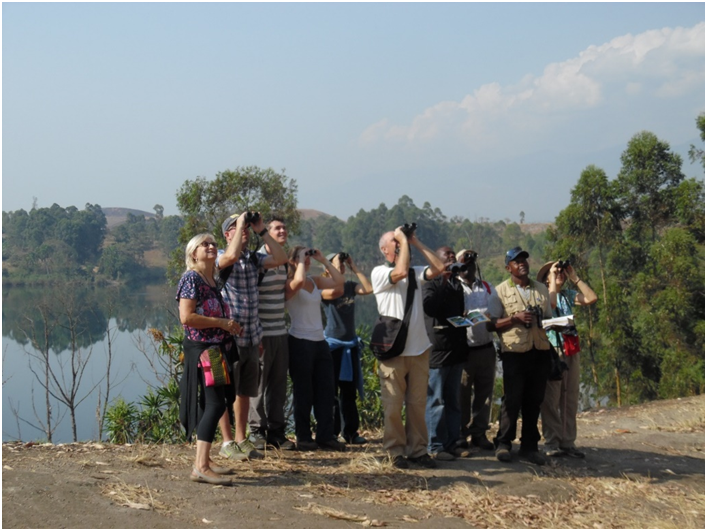 So it was that a dozen bird enthusiasts ventured to the Crater Lake system north of Fort Portal to enjoy some of the water birds present. Our first stop was the main Saka Lake, although heavily fished with lines of netting visible just below the surface, their obvious floating bottles showing how many fishing lines the diving cormorants and Grebes have to contend with. It still had a good number of ducks and egrets present while up to 15 Knob-billed Duck and five Great-crested Grebe were noteworthy. We then ventured on to the two smaller crater lakes Kigere (footprint) and Nyabikere (lake of frogs). These deep, crystal clear waters are not fished to such an extent and the Ducks, Grebes and Cormorants have a much more peaceful existence. Also present here were dependant Great-crested Grebe young, important in an East African context as there breeding numbers are diminishing, while both these smaller crater lakes had good numbers of Red-knobbed Coot, with one pair having six recently fledged young. As well as the targeted Water birds present we could not help but notice the other resident and migrant bird species present and we were rewarded with good views of a pair of Dark Chanting Goshawks which appeared to be protecting a breeding territory as they saw off both Steppe and Wahlberg’s Eagles who happened to fly over their patch. Other avian battles were being fought between a Black Sparrowhawk and Hadada Ibis while an African Marsh Harrier was evading the attention of Swallows and Wagtails. European migrants were still evident with Whinchat, Willow Warblers, European Swift and Barn Swallow all present. A total of 86 species of bird were recorded between us and while not having the lure of the amazing wetlands of Lake Victoria with their thousands of gulls, terns and wading birds we were pleased to be taking part in the Wetlands celebration, indeed all present this morning were pleased to be here and sample the rich avifauna on our doorstep.